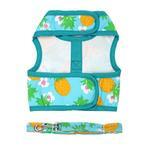 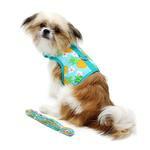 Our tropical Fabric Harness line features our Pineapple Luau print and a matching leash. 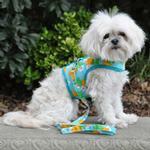 Your dog is sure to be noticed during the dog days of summer in this vibrant fabric harness. 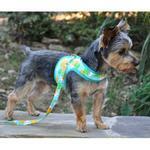 Features reinforced D-Ring strip for extra strength and heavy duty hook and loop tape. 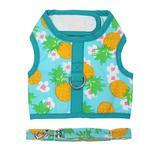 The trendy tropical look is perfect for walks on the beach. The heavy duty hook and loop closures are strong enough to allow you to pick up your dog to lift them out of harm’s way.